(Newser) – A rare voter fraud suspect has been arrested in Iowa, though Donald Trump is unlikely to accuse her of trying to rig the election: Terri Lynn Rote, who was arrested Thursday on suspicion of voting twice, is a registered Republican, the Des Moines Register reports. 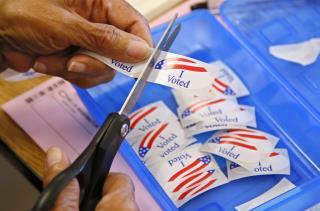 Police say the 55-year-old cast two early voting ballots in Polk County, which includes Des Moines. Two other people suspected of voting twice were reported to authorities, but have yet to be arrested. County auditor Jamie Fitzgerald says these are the first cases of alleged voter fraud that he can remember in 12 years. Invariably whenever anyone is caught tampering or engaging in voter fraud its a republican. Trump say's election rigged by dead voters. Trump say's Putin good, Obama bad. Women bad, his wife good. He changed his mind on building a wall..good. He hasn't paid taxes to support our environment, law enforcement, firemen..good. Illegals don't pay taxes..bad. I could go on, but the easily confused are already chanting on their way to pay taxes..Trump good! Classic republican tactic. Accuse the opposition of something you are guilty of.